The Ultra™ Latch Storage Box line is ideal for those customers who want the ability to quickly identify contents yet need a durable storage solution. The innovative latch design secures the lid to the base, providing a rugged and comfortable grip surface, while keeping items safely stored inside. The recessed lids allow same size storage boxes to stack neatly on top of each other to use vertical storage space efficiently. 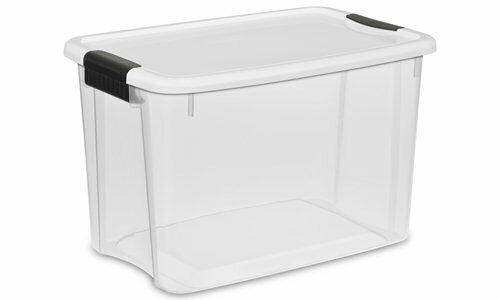 The 30 Quart Ultra™ Storage Box is ideal size for storing shoes, toys, crafts, paint and gardening supplies, and more. 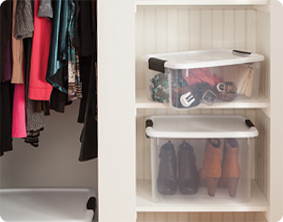 It will fit conveniently on 16” wire shelving, to keep closets, basements, and attics organized. The 18 Qt and 30 Qt Ultra Latch Boxes use the same lid, allowing both the shallow and deep sizes to be stacked in same footprint. The overall assembled dimensions for this item are 18 1/8" x 12 1/4" x 11 1/2". 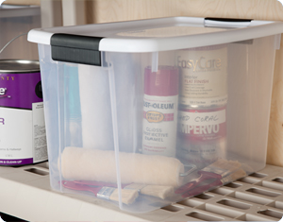 Overall Assembled Size: 18 1/8" x 12 1/4" x 11 1/2"
Keep painting supplies dust free and neatly stored so that when you are ready to start that next painting project you will know exactly where to find your supplies. 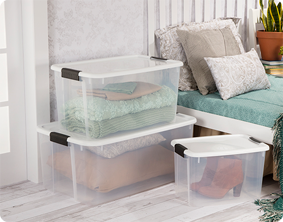 The durability and range of sizes make Ultra™ Latching Storage Boxes a solution for a variety of household storage needs – from boots to blankets, tools to sporting equipment. 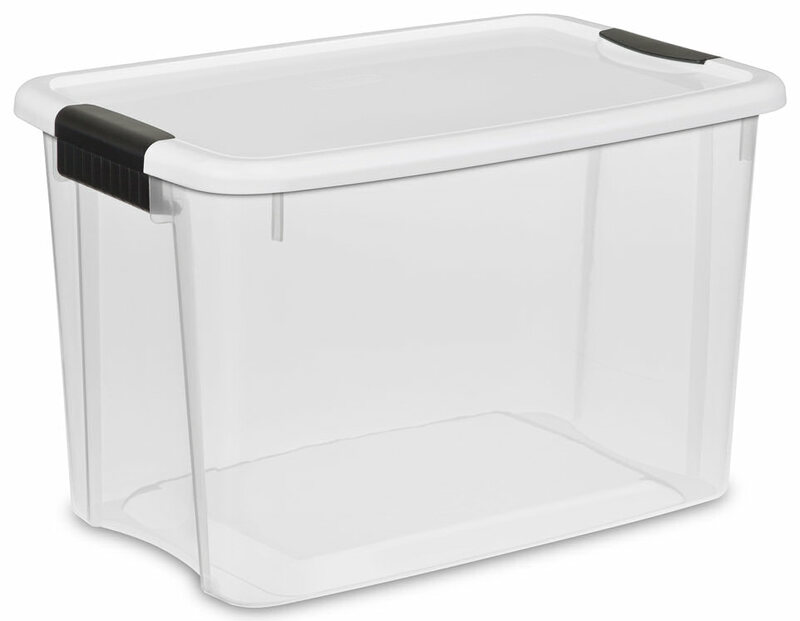 30 Quart Ultra Storage Box is rated 4.6 out of 5 by 10. Rated 1 out of 5 by df1995 from Fell apart Sterilite does not inform the consumer that the plastic boxes it sells are NOT UV resistant. This means that if exposed to SUNLIGHT, they FALL APART. I used several of their containers and let them on my patio for a short time. EVERY SINGLE ONE splintered into pieces just from the sun. Rated 5 out of 5 by Spencer03 from It Saved the Day Thank you for a quality product and a solid latching system. I had a box of snow ski gear fall out of a trailer on the rough highways of LA. I can only imagine it was hit by another car, as I backtracked and found it on the side of the highway scraped and cracked, but still with the lid securely latched. It kept hundreds of dollars of ski gear from spreading across the freeway. Thank you Sterilite. Rated 5 out of 5 by klcoleman from Best for finding things easy! The ultra store system in all sizes is great if you want to store things, but still need to know what's in these containers at a moments notice. They protect everything while still looking great! Rated 5 out of 5 by brado from Perfect For Storage This 30 Quart Ultra Storage Tote features durable latches that attach the lid securely to the base to ensure that contents remain secure when stored. The see-through base allows contents to be easily and is very sturdy and easy to store. Rated 5 out of 5 by Zenobia from Increases my check marks on the to do list every day! The 30 quart Ultra Latch boxes have helped me to accomplish more every day since I tried an order of 6. The size is just right for most storage items and not too heavy for me to lift when full. I can carry one on my lap and still see where I'm going (a real plus when using a wheelchair). The see-through bottom helps me identify the contents at a distance, although for some I also add a label or date. The latch top helps avoid spills and keeps the box secure on shelf or floor and even keeps curious critters from getting in trouble. I use some of the 66 quart size for larger bulky things but the 30 quart is one way I do more in a day and don't have to ask for help! Rated 5 out of 5 by Sunshine7304 from Excellent Alternative To Expensive Pet Food Containers I bought this container during a storage sale at a popular retailer. I wanted it to hold and keep fresh dry dog food. I chose this because it seemed big enough to hold most of a large bag of food and it cost about $25 less than a specialized pet food container. So far, it has done exactly what I wanted it to do. It keeps moisture and bugs out, and the pet food smell in. It is small enough to manage even when full, but it holds most of a 33 lb. bag of dog food. I would definitely recommend this box over more expensive containers made specifically for this purpose. I also bought three other identical containers, which work well for my 5-year-old son's Legos, Transformers, and other bulky toys. Rated 5 out of 5 by Valeree from Toy Boxes I love the clear view and latch tops. I have six stacked on two shelves, easy for the kids to see what we are getting down. The latches keep the tinkertoys, doctor kit, playdough, blocks, cars, animals from crashing out all over as I pull them down. Rated 5 out of 5 by Erinm219 from Endless possibilities! I use these storage boxes for everything from clothes to toys to Christmas decorations. I have also used them when going on vacation. I have loaded them up with food or beach towels. They fit perfectly in my closets, car and basement and are easily stacked on top of one another. You can never have enough of these! !